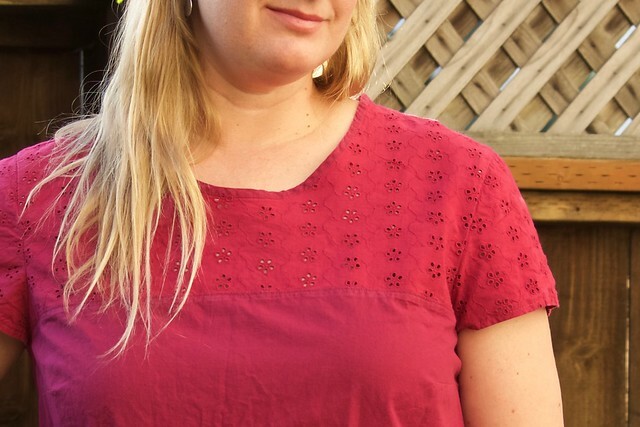 There are tons of woven tee patterns out there. In the Indie scene alone, there’s the Seamwork Akita, Colette Sorbetto, Grainline Scout, Imagine Gnats Bess Top, Made by Rae Beatrix, and the list goes on… There are some slight design differences between each of these that are worth considering, so I’m doing a bit of a round-up here to summarize the features of each pattern. This is certainly not a completely comprehensive roundup, but these are a few of the patterns that were on my radar, so here goes! The Akita uses just one pattern piece which wraps over the shoulders. It has little cap-like sleeves built into the main pattern piece and side slits at the hips. 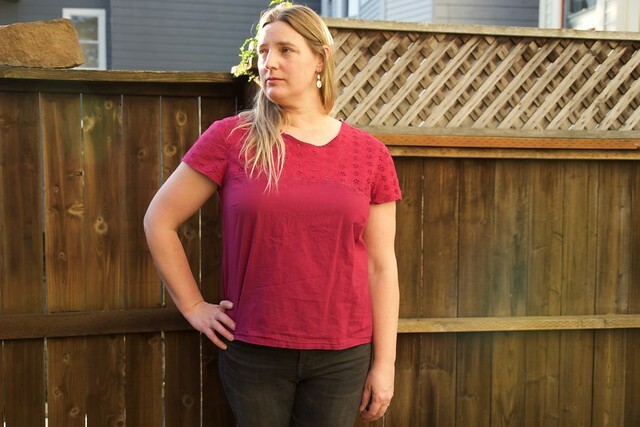 There is minimal shaping in this top, aside from the bust darts. The neckline is moderately wide. It has a shaped hem and is a bit longer than most other patterns, hitting at the mid to low hip at the sides. Here are some inspiration pics: pretty eyelet from @les.cousette.de.julie and a blue floral from Blogless Anna. 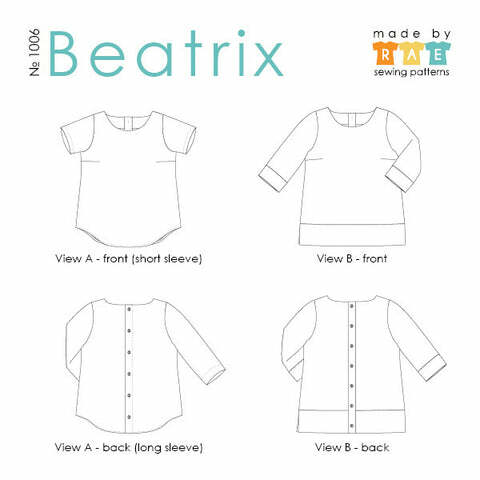 The defining feature of the Beatrix pattern is the button placket down the back, but the buttons are not necessary to get in and out of the top – it can slip over your head. There are two views featuring short or three quarter length sleeves and a curved shirt tail hem or banded hem. 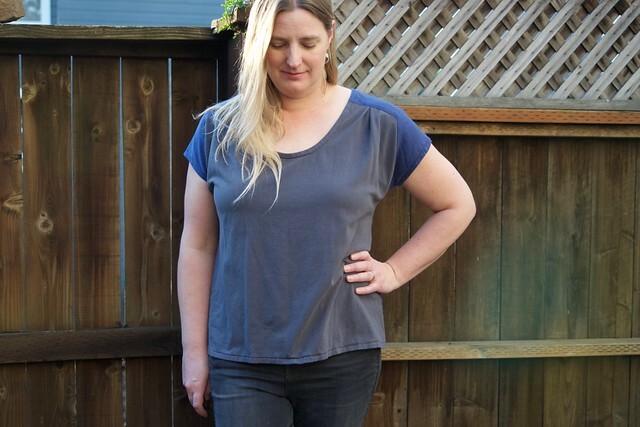 The Beatrix has bust darts and moderate shaping at the side seams. The neckline is high – similar to the Akita, but not as wide as the Akita. The Beatrix is finished with facings instead of bias binding. 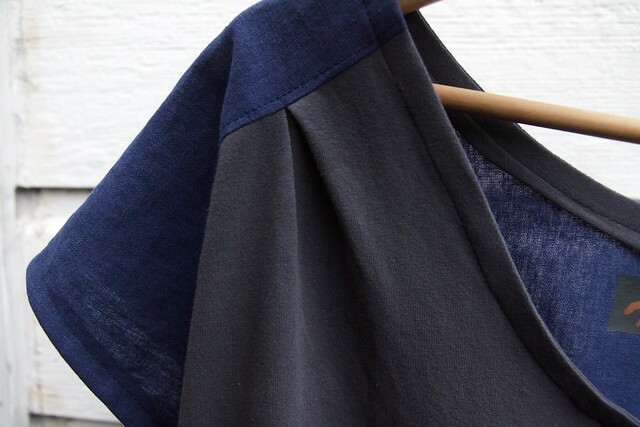 The Bess Top is another simple woven tee with a twist – or in this case, with a pleat. It’s got an easy loose fit and no darts. The sleeves are formed by wrapping the back piece over the shoulders – great for color-blocking, not great for directional prints. 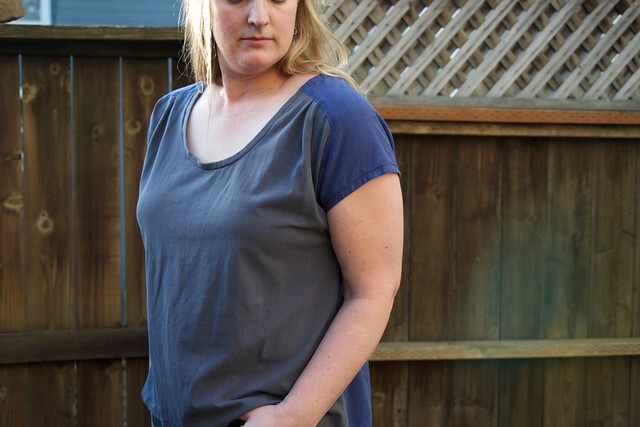 The Bess Top comes in shirt, tunic, or dress length with a scoop neck or higher neckline. It has a hi-low hemline. The Scout Tee is a true basic woven tee – you can’t get much more basic than this. It has a simple A-line shape, straight hemline, scoop neckline, and set-in sleeves. This one definitely falls into the ‘boxy’ category. 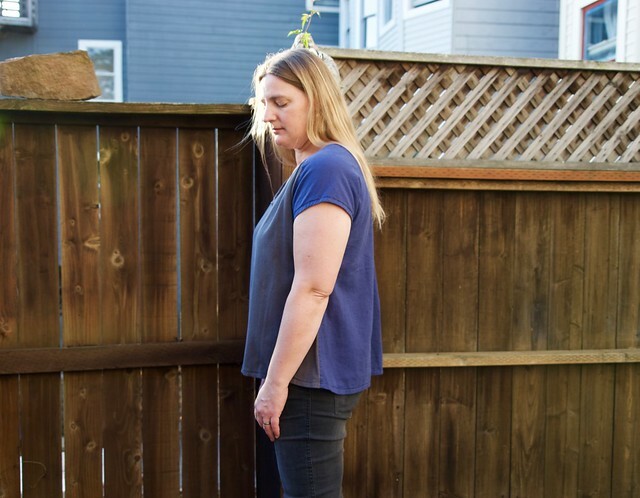 The hemline hits higher on the hip than any of the other patterns. 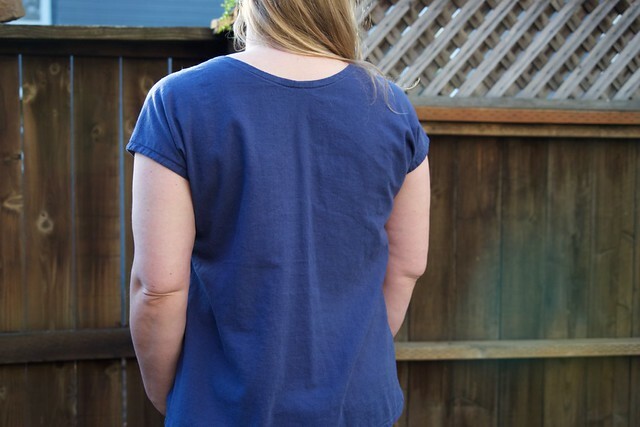 If you want to fancy up your basic tee, Jen has a tutorial for a Madewell version on the blog. The (free!) Colette Sorbetto pattern has been updated with their new block and a couple of new options. 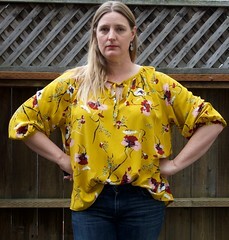 It now includes set-in sleeves and a tunic-length version with a split hem in addition to the basic sleeveless version. 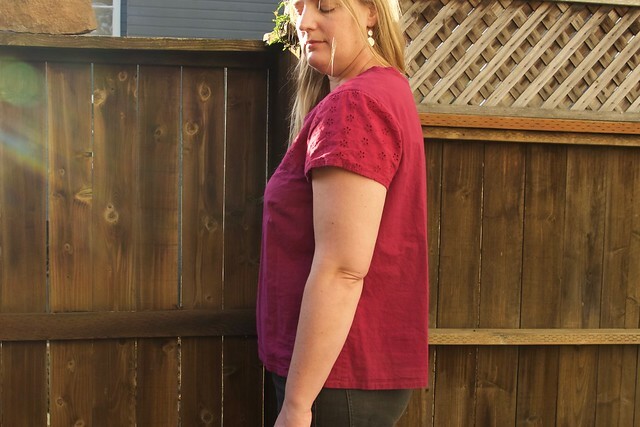 The neckline is scooped and the hem is straight, hitting at the mid-hip. There is a big box pleat running down the center front, which is super easy to remove if you like. The Sorbetto has bust darts and minimal shaping at the waist. 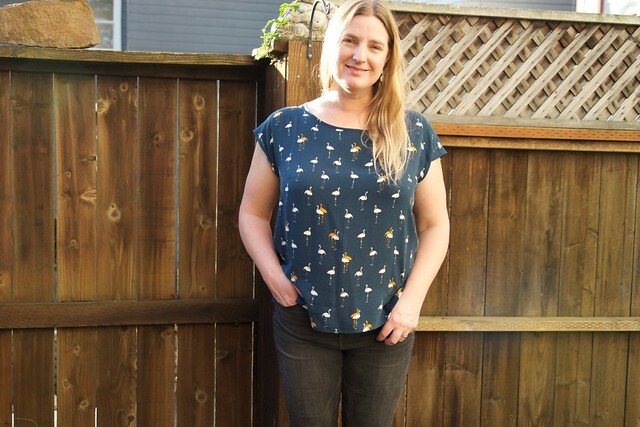 I’ve had the Bess Top pattern for a while and finally got around to sewing it. I love how the back wraps over the shoulder and I love that little pleat detail on the shoulder – so cute! I like the length and style of the sleeves on this pattern too. 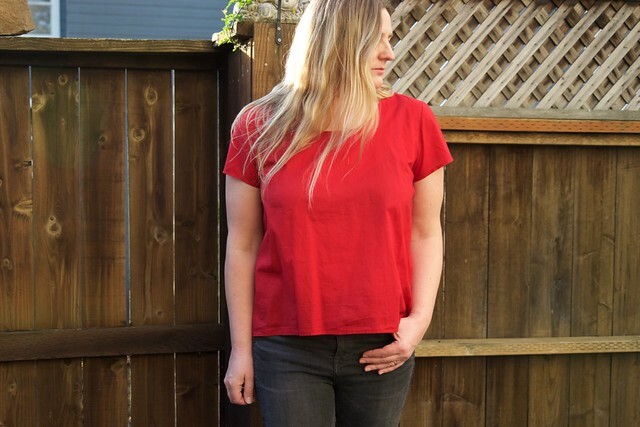 I suppose that I cheated on this pattern because I didn’t make it (completely) out of a woven fabric – I used a stretch cotton jersey for the front and a remnant woven linen from my stash (maybe a cotton-linen blend?) for the back. The color and fabric combination works so great with this pattern. I also used the jersey as a way to finish the seam allowances on the linen – I simply trimmed the linen side of the seam allowance, then folded the jersey side of the seam allowance over the linen side and topstitched it down – simple and functional. 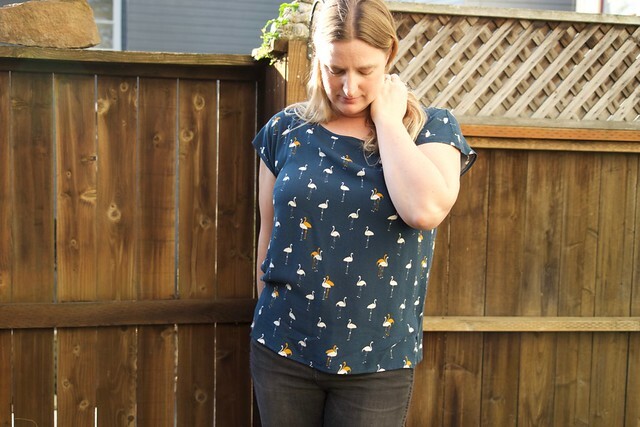 This top comes with a scoop neck and a higher neckline option – I used the scoop neck, but I think I might have preferred the higher neckline. 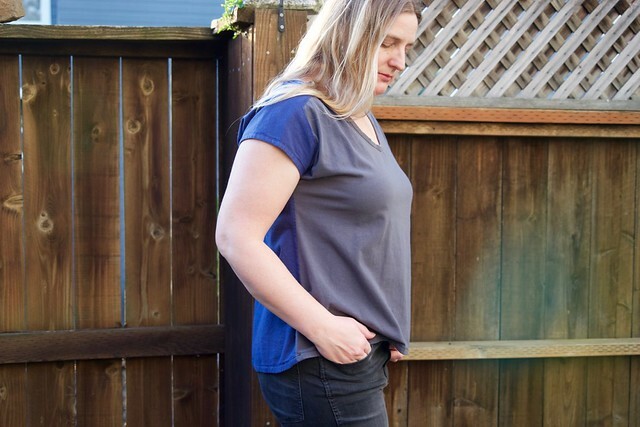 The scoop neckline looks fine, but since it’s such a loose fitting top, the neckline hangs open if I lean over and shows off everything (ahem). The neckline binding is also a bit loose – I should have shortened it a bit since half the shirt was made from a knit fabric. I was between a 14 and 16 according to the size chart and cut out the 16, but it ended up a bit looser than I was expecting. 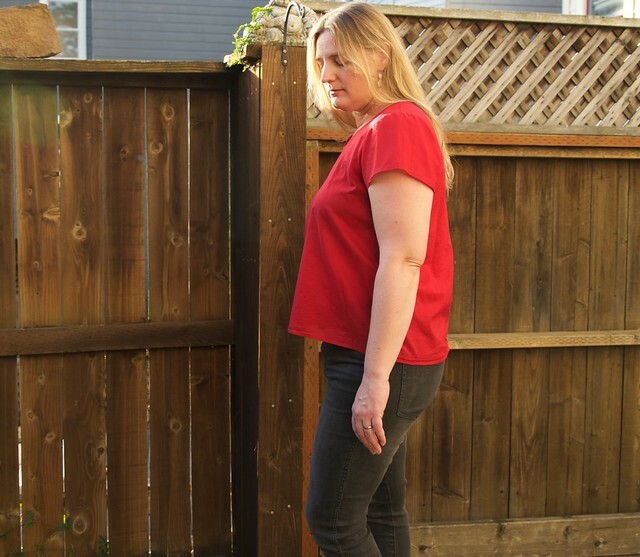 In general I like the fit, though it could be a bit slimmer below the waist, so next time I would grade to a 14 at the hips or maybe even cut a straight size 14. Ahhh…the scout tee, the quintessential woven tee. I loved that red lawn version from Little Home by Hand so much that I decided to just flat out copy it. It is quite striking in red and super cute from the front. But I just don’t feel very comfortable in this top because it’s shorter than I’m used to. 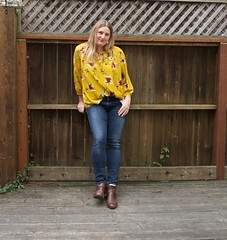 I feel like I can’t raise my arms without showing off my belly, even when I’m wearing high-waisted jeans (I am wearing the highest waist jeans I own in these pics). And I don’t love the tent-look you get on the side-view – not the most flattering look for me. Granted, the tent-look would probably disappear almost completely in a different fabric, like a rayon crepe (which is exactly what the fabulous flamingo fabric is). I’m not sure if I would make this one again. Maybe? The fit in the shoulders is nice and the neckline is good. If I did make it again I would probably lengthen it a bit and use a fabric with more drape. It just didn’t blow me away enough to use with my special fabric. 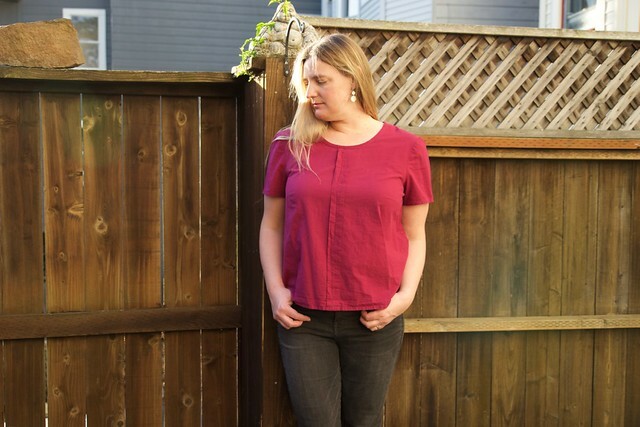 I made version 3 of the new Sorbetto pattern in another cotton lawn – this time a magenta berry colored lawn. 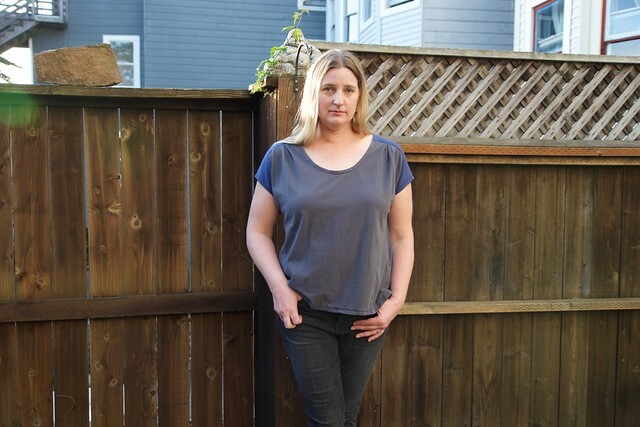 I like the pleat on this top, at least in theory…however, my fabric is so prone to wrinkles that I can’t get the pleat to look nice and crisp since I washed it. And I have given it quite the beating with the iron! I sewed this one with french seams, but otherwise with no adjustments. I liked this versatile pattern enough to make a few fit adjustments and make another version. For the second one, I eliminated the center pleat, raised the bust darts a bit, lengthened the bodice 1/2″, graded to a size 14 at the hips, and shortened the sleeves to make them more of a cap sleeve style. Oh, and also hacked the front piece into a separate yoke and body so that I could incorporate this little bit of berry cotton eyelet fabric. 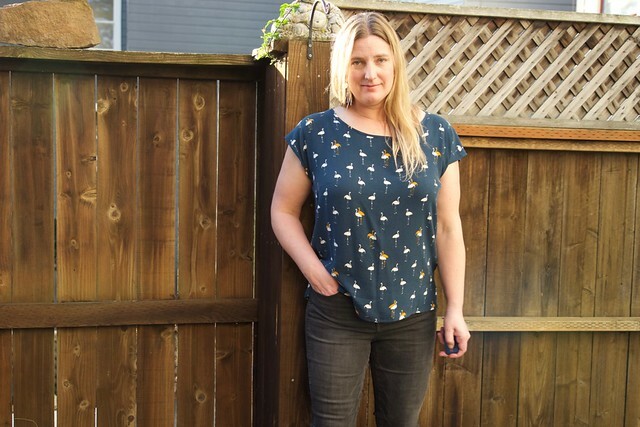 I really love how this turned out – the eyelet fabric is a sweet touch and the fit is almost perfect – I might want to lengthen it a bit more for next time. I’m sure I will make it again! 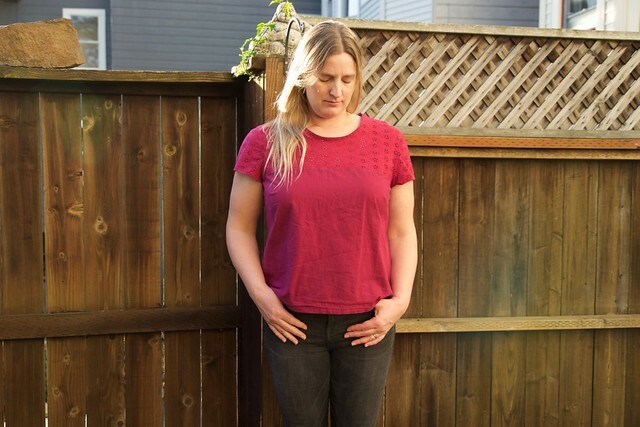 The Colette Sorbetto is a nice basic woven tee – a great building block for hacking or just churning out some basics. After the fit adjustments I made, I can totally see myself making this one again. I’d like to try out the long tunic length version as well. 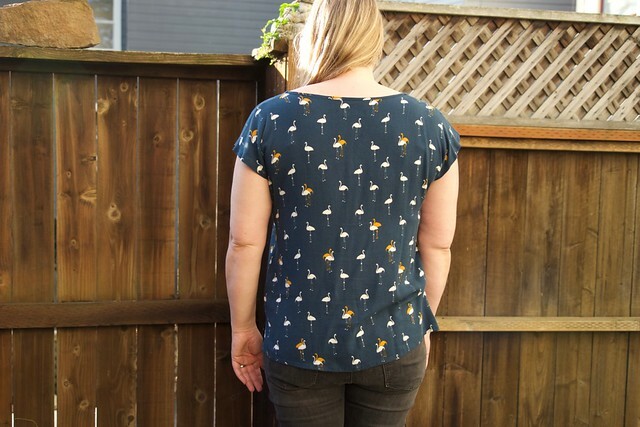 So after trying all of those patterns, I ended up back with my trusty Seamwork Akita. I guess there’s a reason we call them tried n’ true. Why the Akita? Well, it turns out that I like (a) long shirts, (b) short sleeves, and (c) a slim, but straight fit (with darts!). Bonus? 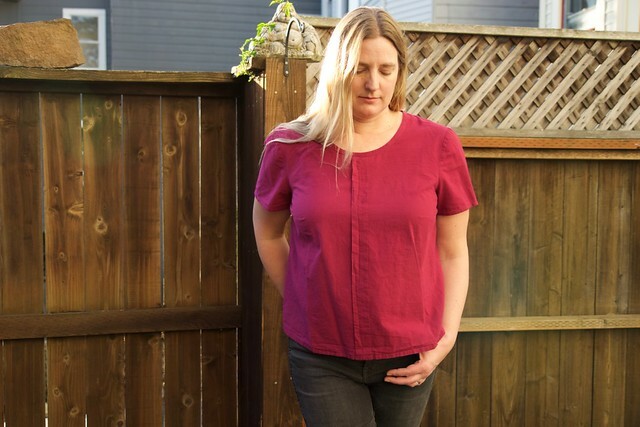 It’s super easy to sew – no setting in sleeves here. 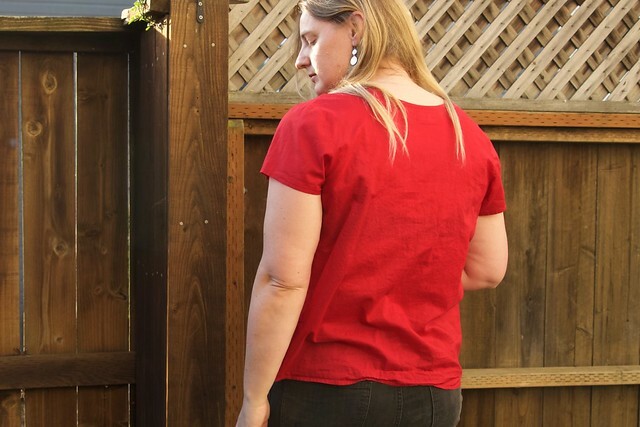 It was also easy to hack this pattern to work with a directional fabric. I simply cut the pattern along the shoulder line (this corresponds to the widest part of the ‘sleeve’ on the pattern) to create a separate front and back and added 5/8″ seam allowances to each. Then you just sew the front and back together at the shoulders and continue per the instructions. 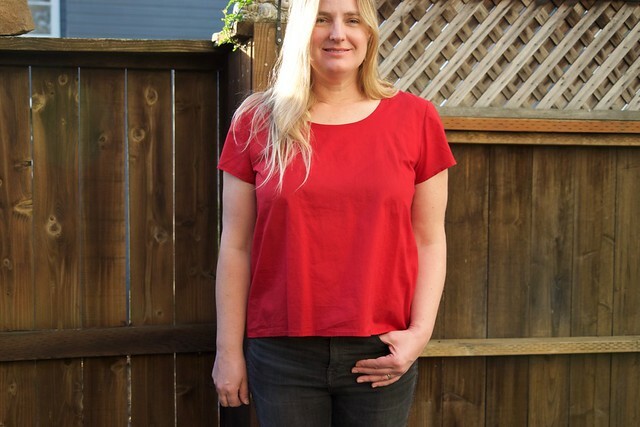 I did have a few issues with the fabric – it’s shifty and drapey (yes, I know drapey isn’t really a word, but it should be), which resulted in a super wide neckline and a wonky uneven hem when I sewed it up. 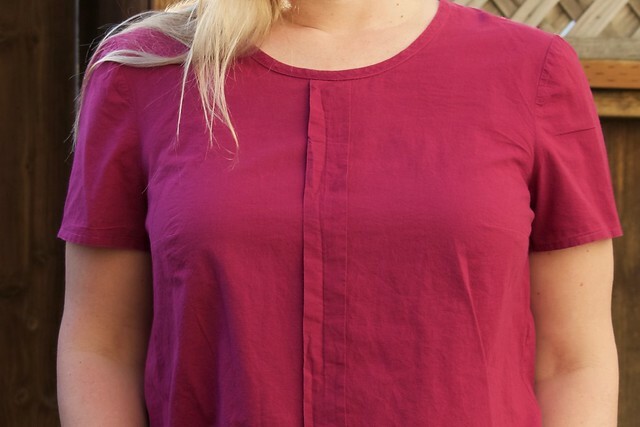 To fix the neckline, I just went back and sewed the shoulders with a larger seam allowance – I think I took close to an extra 1/2 to 3/4″ out of that seam. To fix the hem, I just carefully recut it to even the whole thing out. The result is perfect – the neckline sits nicely (not dropping off my shoulders or exposing bra straps) and the length is just right too. Oh, and it goes perfectly with my Blackwood cardigan too! What can I say? Tried n’ True, people. 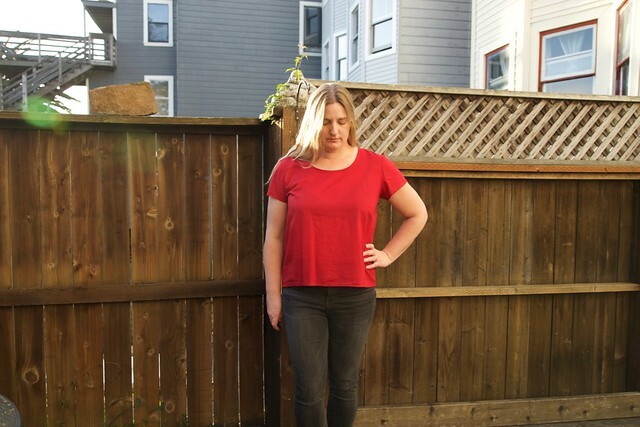 I will be using this pattern again – you could totally hack it (front yoke, back yoke, add some gathers or pleats, or make it into a knit tee)! 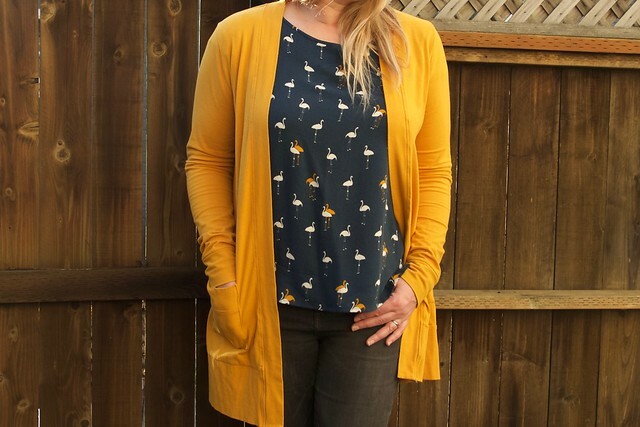 I love my flamingo Akita – I wear it all the time and it easily dresses up or down. Spring is here! Our backyard smells of sweet jasmine, flowers are blooming, our blueberry crop is plumping up, and it’s warm and lovely outside. And I’m so ready with a pile of woven tees! Happy Easter! Hey, Patricia…they all look great. I especially like the red on you. I agree though that longer is better. You are really developing as a seamstress and making bold choices. I’m glad you enjoy it. 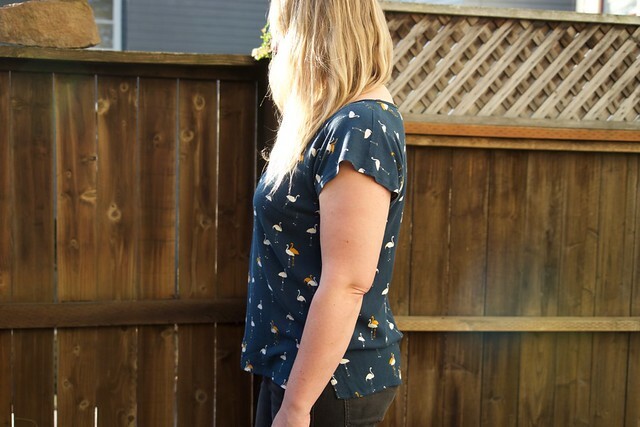 I am so impressed with your blog and all of your sewing! I love how organized and well documented all your projects are. You seem to be a natural at sewing and blogging! You’ve inspired me to make the sorbetto top. The Akita top looks pretty awesome too. That will be next! Thanks Gina! The Sorbetto is a great choice – you’ll have to show me what you make!